Come enjoy this brilliantly located and spacious 3 bed/3 bath townhouse which can accommodate up to six guests! With features such as a quiet, low traffic area within the fabulous Windsor Hills Resort Community, and a private pool area, you’ll be sure to achieve the peace and tranquility that you are seeking on your next holiday! 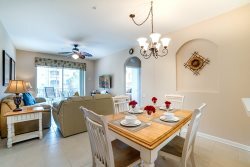 The position of this elegant south facing townhome not only enables you the opportunity to catch some Florida rays, but it may also offer guests a magical surprise on some early mornings, as the position of the home is on the same course as local air balloons flight path. Watching balloons float by in the gorgeous Florida sky while you sip your morning cup of coffee (optional feet dipped in the pool) will truly add another magical memory to your vacation! While you are just 2 miles to Disney, get the children in the mood and live out their Disney dreams while staying in their very own fun Mickey Mouse bedroom. You and your family will love this Windsor Hills home! Check out below to find out more details on what this fantastic townhouse and the amazing Windsor Hills resort has to offer you! I and my family were very happy with the experience of lodging in a house and for sure on our next trip we will look for a house with Select Vacation Villas. Very comfortable place to stay. The gated community makes it a very secure place. Very close to shopping areas and parks. I didn't actually meet or talk with any of the team. I was e-mailed directions and the code for the door about a month before my stay. We arrived, enjoyed our stay and left without a hitch . I had no need to call the office. My family absolutely loved this townhouse. It was nice and bright, exactly as shown in the pictures. We liked having our own pool and used it everyday. It was close to shopping and parks. Exceptional. Very quiet, friendly, beautiful grounds, pool and amenities. Far exceeded our expectations. We have already recommended Windsor Hills to othe family members after sending them photographs. We initially had a problem with the television service - it was temporarily out, but came back on later that night. Your office was helpful in leaving the message for someone to check it, after I talked with them ( it was close to 5 PM. ). The TV's in the unit were great! The town home was very nice. Decorated very tastefully and practically! We really appreciated that you provided strollers and car booster seats and loved the sofa and love seats with the recliners. Also thought the small table with the umbrella on the lanai was a great addition! We were most pleased from or first contact with team members to the last. Accommodated with ease some last minute arrangements. We had a wonderful vacation and hope to stay back with you next year! There are so many magical memories from our vacation. The parks, shopping and restaurants were minutes from the Windsor Hills resort so we were able to have a new adventure every day. We will cherish the time we were able to spend together as a family. Loved the property, the location to Disney, the ESPN Wide World of Sports and other attractions was perfect. My 11 year old son commenting that he could live here.